Anyone who’s ever had an evil clown fear will be validated by Eurocenter’s new game app, Cocoto Magic Circus. A frightening clown has abducted Pixie, a fairy, and it is your duty to save her alongside your little monster friends. Unfortunately, the evil clown has trapped the group of you inside the evil circus, and you’ll have to dodge every obstacle and play every darts game in order to save Pixie and escape. Instructions for every game are found at the beginning of every round, but the tutorials are extremely comprehensive, as they feature all five theme rides (Abyss, Jungle, Volcano, etc.) for a grand total of 35 games. Oh, and don’t shoot the red balloons, just the green ones. 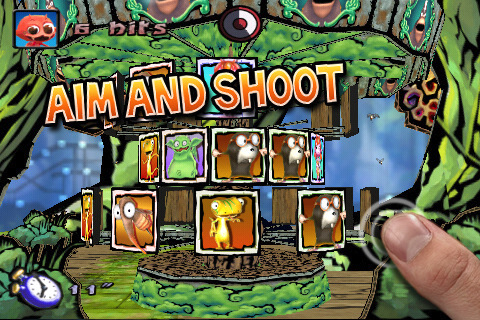 Cocoto Magic Circus is a fairly straightforward shoot-’em-up type of game, with rounds that are repeats of the same theme (Matching, Boss, Save the Fairy, and so on…), but that doesn’t mean it can’t be fun–it is, almost absurdly so. The huge cast of uniquely designed characters, the bright flashing colors, and sudden changes in pace all add up to a really entertaining atmosphere. In fact, there’s so much going on in this game app that sometimes the loading pages freeze for a few seconds, but then it’s back to testing out your trigger finger. Get this app (now on sale for $0.99) because it’s cute, quick, and makes the best of mindless entertainment. AppSafari review of Cocoto Magic Circus was written by Julie Guan on March 6th, 2010 and categorized under App Store, Fun, Games. Page viewed 3617 times, 1 so far today. Need help on using these apps? Please read the Help Page.